6 reviews of Hotel Alpine Palace in Hinterglemm, Austria. Mr Howard from Cheshire has written 3 reviews and been voted helpful 9 times. I'd give it Six out of Five if I could! Going back here for the third time in a row and wouldn’t go back somewhere if I didn’t enjoy it – the Alpine Palace is one of the best hotels I’ve ever stayed in. The Alpine Palace has the best spa ever with an outdoor heated pool and there’s a games room too. Breakfasts are pretty damn good, they cook you fresh egg, bacon, omlet etc however you like it. Dinners are fantastic, 5 courses every evening including salad, soup and a main so I’ve never felt any need to eat out in the resort while I’ve been there. The staff have always been courteous and very good, you can always have a bit of banter with the staff behind the bar! I've never stayed in the real luxury part of the hotel, I always have a room in the cheapest bit of the building which I call “3 star accommodation” and has your average hotel rooms. You still have access to all the hotel’s 5 star facilities if you’re staying here though. The hotel is in the centre of Hinterglemm, right by the small gondola lift that takes you up one side of the mountain. You can ski back down if there’s good snow but we usually go here quite late in the season when there isn’t enough to ski down. I’d give it 6 out of 5 if I could! Mr Armstrong from Lancaster has written 2 reviews and been voted helpful 5 times. Been four times and will be back! We love the hotel and have been here 4 times as a family, and we will definitely stay again. The food is very good – they do a 5 course dinner with a choice of 2 or 3 starters and main, and a salad bar and cheese and biscuits. My wife and daughter love the food – I prefer the pub up the road who do a fantastic steak and chips! We've tried both and think the more expensive rooms are not worth the extra cost, so I'd recommend the cheaper ones. Pippa Gervis from Cheshire has written 1 review and been voted helpful 2 times. A fabulous hotel. Honestly the nicest hotel in any ski resort I’ve ever visited, and I’ve skied in a lot of places. We love it! There are plasma TVs in the rooms, it’s right on the slopes, and there’s a beautiful spa. The décor is beautiful too – kind of rustic but modern. It has everything you could want, even a casino. Anonymous from Cheshire has written 3 reviews and been voted helpful 9 times. Our 5th year on the row staying here. 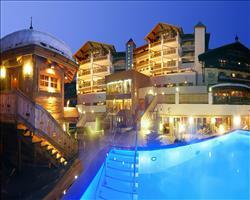 An excellent hotel with good service, nice spas and a location right on the slopes. It’s quite good for families. Only downside is that things like the bar are expensive when you’re there. Hinterglemm is a good resort with quite a lot of skiing, apparently they’re linking it up with Zell am See soon. Amy has written 2 reviews and been voted helpful 4 times. The spa was amazing! The hotel is kept clean throughout and though the rooftop bar wasn’t open, the other bar was lovely. The food was very good. It was quite traditional, with a different choice of food on different nights. The a la carte nature of it may not be everyone’s cup of tea but we liked it. At breakfasts they handed out leaflets on the various different things you could do if you didn’t want to ski, like horse and cart rides or sledging. Bedrooms were small and very basic but perfectly well equipped for what we needed. The beds were comfortable. The hotel is very well situated for the slopes and to get to the ski rental – a 30 second walk for both. The boot lockers are really good – you get an individual locker per room and they’re heated. Rachael Wheeler from Mirror Online has written 1 review and been voted helpful 0 time. Wow. My annual trip, which normally consists of skiing and sleeping, was transformed into so much more. Grappling with dodgy boots is more tolerable when you have a spa to return to, complete with a heated outdoor pool (and, er, naked Austrians). I looked like the smug woman in one of those “Visit...” adverts as I clutched my glass of bubbly and laughed my aches away in the mountainside hot tub. In fact my room’s gigantic bath was a godsend in itself when it came to learning how to snowboard for the first time (note: take the rose petals out first, unblocking the plughole defeats the object of a relaxing soak).